Surrounded on three sides by Cherokee National Forest, Tennessee’s Martha Sundquist State Forest is the only one in the state forest system with a dedicated hiking trail. The Tennessee Gulf Trail (named for a former owner of the property, Lambs Gulf Company) follows Brown Gap Creek from the northwestern to the southeastern corners of this 2,000 acre cove hardwood forest. Martha Sundquist, an outdoors enthusiast and former First Lady of Tennessee, suggested that the state forest bearing her name include a footpath for hikers. We’re certainly glad she did. 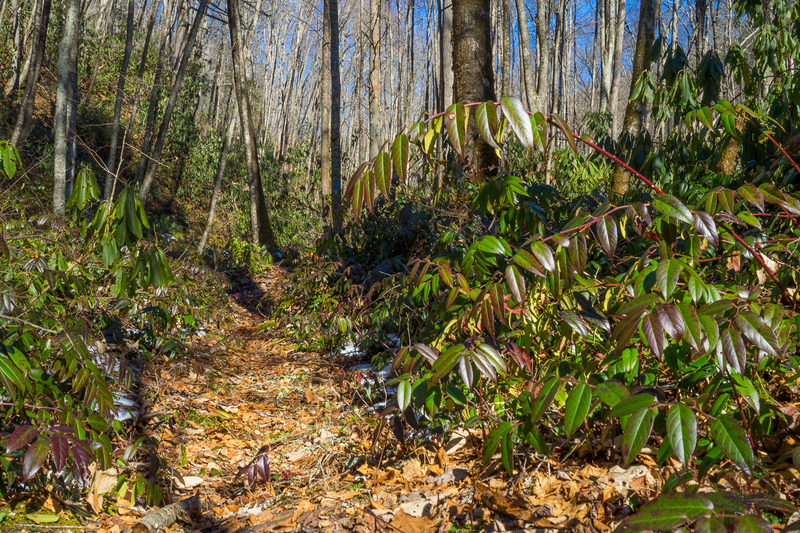 The easy, rhododendron-lined 3.3 mile trail was opened in 2010 and is very well maintained. We were lucky to find a couple inches of snow lingering on the ground, only enhancing the already lovely scene, as we explored the Tennessee Gulf Trail on Sunday, February 8, 2015 between 9:30AM and 1:45PM. Our plan was to start at the lower, northwestern trailhead and hike to the upper, southeastern end, then return the same way. There are three different seasonal photo galleries at the bottom of this trail report. Hike Configuration: Up and back. Blaze: Blue. Hike Rating: Easy. Mostly level, with limited climbing. Trail Condition: Very good. All creek crossings are over footlogs (watch for ice in winter). Some exposed roots and rocks are tripping hazards. Very well maintained. Starting Point: Trailhead along Gulf Road, just down the access road from the state forest entrance sign. Trail Traffic: We had the forest all to ourselves on this beautiful sunny weekend. How to Get There: Take I-40 to exit 447 at Hartford, TN. From the interstate bridge, go north on Big Creek Road for 8.7 miles to the intersection of Bull Mountain Road and Gulf Road. Turn right onto Gulf Road and go 1.7 miles to the first state forest sign. Turn left on the forest access road at the sign and go a hundred yards. There is limited parking, but more if you ford the creek. When you reach the first sign board at the entrance to Martha Sundquist State Forest you have a choice to make. Start hiking the Tennessee Gulf Trail from the lower trailhead, or continue up Gulf Road another 2.9 miles to the upper trailhead. We chose the former. To get to the lower trailhead, take the access road left of the sign board. It’s about 100 yards to a creek crossing. You can park at the crossing, then walk over the creek on a footlog, or you can ford the creek in your vehicle and park on the other side. Look for blue blaze marks on the north end of the parking loop to begin the trail. Dave and I drove from WNC to meet the same Eastern Tennessee folks we had hiked with a few weeks prior at the False Gap manway in the Smokies. There were a couple of absences and a couple additions, so we had the same size group of nine. We also had two pooches along for the trip as well. Grace, Dave’s black-and-tan hound, and Cowboy, the always-busy cattle dog. As it turned out, we would be the only ones in the state forest on this bright, sunny February Sunday. Just moments after beginning the hike we had to cross a footlog over Brown Gap Creek that was covered with snow and ice on this chilly morning. At least 40-feet long, this footlog was a challenge for hikers and canines alike. Apparently at one time in his past, Cowboy had taken a nasty fall from an icy footlog, so he instead chose to swim the creek. Brrrr! But he came out no worse for wear, ready to herd all the intrepid hikers, and continue up the forest road. If you ford Brown Gap Creek in your vehicle, you can drive an additional half mile up this road to a gate to shave that distance off your hike. We didn’t mind walking the road. At the gate, the well-signed trail takes off to the right. It starts out in a northeasterly direction then makes a swooping turn to the southeast and maintains that direction to the other end as it follows Brown Gap Creek. This 2,000 acre tract of land was purchased in 2001 from International Paper Company (formerly Champion International), who owned the property since about 1930. Prior to that it belonged to Lambs Gulf Company. Located in Cocke County near the North Carolina-Tennessee border, it is 70 miles east of Knoxville. The Martha Sundquist State Forest “Gulf Tract” is surrounded by Cherokee National Forest on three sides. The forest is composed of mature mountain and cove hardwoods. A harvest rotation schedule was developed and followed closely by the previous owners and large stream-side management zones, some as large as 80 acres, have been established. This tract is considered a wildlife management area and has special provisions for seasonal bear hunting. It will be used primarily for recreation, hunting, fishing, timber production, and demonstration. Once you are on the blue-blazed single track trail, you’re surrounded by rhododendron and magnolia, birch, white pine and maple trees. Throw in the occasional very large hemlock, and this is a beautiful forest. Because of the cold, the rhodos had that droopy, winter appearance. After crossing a 2nd footlog we encountered two inches of snow on the trail. We certainly weren’t expecting that. It was a very nice touch though, enhancing the already appealing scene. In general, I’m not a big fan of snow. Under certain conditions though, it can really enhance a hiking adventure. 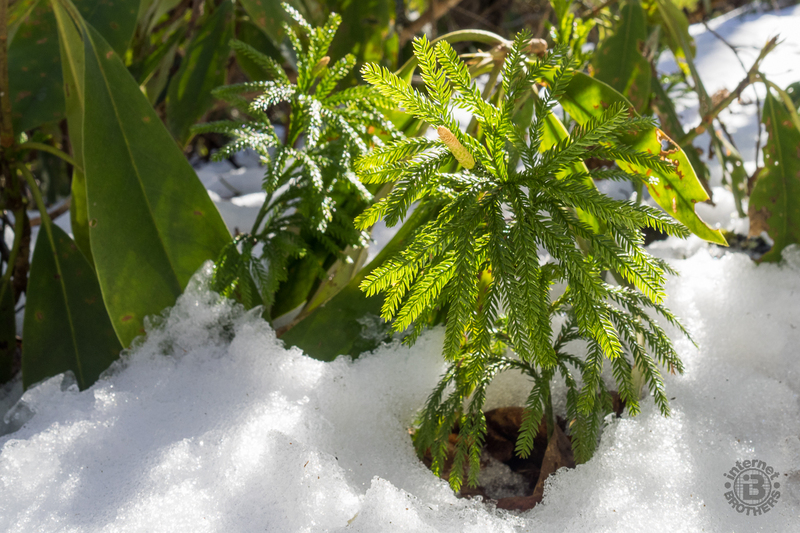 The two inches we encountered on the Tennessee Gulf Trail was just right to make this budding ground cedar even more beautiful. The snow was still a little crusty as we started in the cold, but by afternoon it was beginning to get slushy and melt. The trail stays on the west side of Brown Gap Creek for most of its length, but it does reach 3rd and 4th footlog crossings. These tulip poplar footlog bridges are named for area volunteers who were instrumental in the development and building of the Tennessee Gulf Trail. By the time we reached the 3rd crossing, Cowboy was evidently tired of the cold water, so he mustered his bravery and successfully navigated the narrow log. After that, he was good on the footlogs the rest of the day. About two-thirds of the way through the hike, we reached some of those management zones mentioned above. Two other creeks come in from the east to meet Brown Gap. At these confluences of Laurel Creek and Middle Prong, the foresters have cleared the area of timber, leaving only the low-lying heath and ground cover. I don’t know what the camping regulations are in the state forest, but there are a few sites here that would be ideal for a tent, or a family picnic. In fact, the trail builders did a marvelous job of keeping the pathway near Brown Gap Creek. We found ourselves pausing frequently, simply to enjoy the natural beauty of the babbling stream. There were only two places where the trail had to climb above the creek to navigate the terrain, and both of those only lasted a couple hundred yards. The final quarter mile to the upper (southern) trailhead is gently uphill. You come out on Gulf Road. We were all ready for lunch, so it would have been nice if there were some logs or boulders nearby to use as seats. Instead we walked up the road a ways, crossed the creek again, and found a sunny spot along the side of the road. No more than 10 miles to the east, the Martha Sundquist tract is near Max Patch, a popular mountaintop bald along the Appalachian Trail in North Carolina’s Pisgah National Forest. The Tennessee Gulf Trail is the first phase of a trail project that will eventually connect the State Forest to the Appalachian Trail. Starting at Max Patch, hikers will follow an old road through Cherokee National Forest to Martha Sundquist State Forest. After following the Tennessee Gulf Trail, the route will ascend through Brown Gap to the Appalachian Trail and then loop back to the parking area at Max Patch. This connector will be constructed by the U.S. Forest Service. While we hiked the length of the Tennessee Gulf Trail, the air temperature warmed nearly 25 degrees. So on the way back, the snow was becoming slushy, and was even completely melted in some spots like this one. The dog hobble that lined the trail was literally glistening. The return is back the way you came. Obviously, you could walk back on Gulf Road, but who wants to do that when you can follow a soothing creek side path. As the morning became afternoon, we were all shedding jackets and other layers, and the brilliant sunshine warmed our faces. It seemed we all had a separate pace as we each enjoyed the forest and creek in our own way. So we got kinda scattered. We would usually group back up at the creek crossings and make sure everyone was accounted for. I got a great kick out of watching Cowboy perform what he was bred for. He would be running back and forth along the trail herding all the hikers to make sure we were all in line. Once he had done his job, he would herd the nearest rock, or stick. Cowboy was one busy, and fun dog. I bet he slept really well that night. To summarize, I highly recommend Martha Sundquist State Forest. You could almost call it a secret. This little-known recreation area is remarkably beautiful. The Tennessee Division of Forestry has done a wonderful job on the Tennessee Gulf Trail, and at managing the forest within the boundary. There are three other mile-long loop trails that take off from the Gulf Road within the state forest tract, and, there is a nine-mile horse trail. I know I want to go back to Martha Sundquist, especially in Spring to enjoy the wildflowers, so I may give these shorter trails a try too. Update May 8, 2015: When I hiked Martha Sundquist State Forest last winter, I told myself I would come back in spring. A visit from my brother in early May seemed like a great time to do just that. The trail was considerably different three months later as you will see from the following new pictures. Update November 5, 2017: A visit to Martha Sundquist State Forest in the Fall seemed in order. Unfortunately I was 7-10 days late to enjoy peak coloring. Still, as always, the Tennessee Gulf Trail is a delight, and the surrounding countryside did offer some hints of chromatic goodness. If you haven’t yet been to Martha Sundquist, what are you waiting for?